Q: I need a stock size replacement filter. Can you help? A: No, we do not stock any filters. We specialize in custom made metal filters and strainers that are built from customer prints or specifications. As much as we would like to help, we can’t. If you need custom metal filters or strainers in the future, please think of us! Q: Why are so many metal filters and strainers constructed from stainless steel? A: Stainless steel filters and strainers offer a high degree of corrosion resistance. Many of the process industries that use metal filters and strainers introduce moisture or caustic fluids to the filtering element. For these reasons, stainless steel is a natural choice. Thanks to advances in welding technology, many of the filters and strainers that were historically made from Monel are now constructed with cost-effective, long-lasting stainless steel. Roughly 90 percent of the metal filters and strainers manufactured by Yankee are constructed with stainless steel for these reasons. 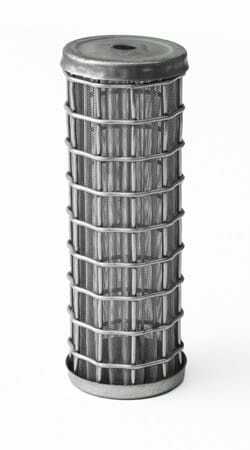 Q: How can custom made metal filters and strainers manufactured by Yankee Wire Cloth Products save my company money? A: If you are currently buying proprietary metal filters and strainers from a distributor, chances are that your parts are marked up by as much as 25%. By buying direct from the manufacturer, the middle man is effectively eliminated and the savings are passed along to you. In many instances, there is a perception that custom parts are more expensive. Because we have been in business since 1963, we have accumulated thousands of special tools that may be used to make your part. Send us your drawing and see if your proprietary metal filter or strainer can be manufactured in a more cost-effective manner. Q: What is the difference between perforated material and wire mesh screen? A. Wire mesh is a common type of metal screen consisting of parallel rows and intersecting columns of wire. Although similar in appearance and their applications, perforated metal sheet is not a type of wire mesh. Perforated metal is a form of sheet metal which has been punched or stamped with a machine to create a pattern of holes. Q: I am an individual, can I purchase filters and strainers from Yankee Wire Cloth Products? A: Sorry, but we only sell parts to businesses. Q: What is your standard lead time? A: Our typical lead time can run 3 to 7 weeks. If your part requires fixture or tooling, there would be an additional engineering lead time. See how our approach can deliver results for you today.